How Do You Continue to Improve? 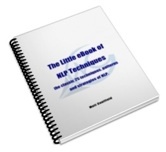 To help you on your journey to review, revise and improve your NLP skills I have produced a series of ebooks. To save you time and money I have collected together my current three ebooks as one single downloadable bundle. A complete set of gimmick free flash cards to help you improve your language skills. The 25 classic techniques of NLP, including the Fast Phobia Cure and the Swish Pattern. Dozens and dozens of ideas to help you practice your skills. These three ebooks are the exact same ones you get as additional learning materials on my NLP Practitioner training. 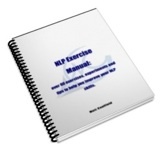 A collection of all the NLP exercises I use on my trainings, workshops, practice groups and when mentoring NLP Practitioners. I made it available as printed version to members of my practice group in 2006 and it is part of the supporting literature for my NLP trainings. Over 60 exercises. To get effective at the language skills of NLP requires constant practice. These flash cards are an ideal tool to help you and I have found them invaluable through the years. For a simple gimmick free way of practicing and perfecting your language skills these flash cards are an ideal tool. These cards come as a pdf download for you to print out. It is often said that NLP is “an attitude that leads to a methodology, that leaves behind a trail of techniques”. Techniques are not NLP, they are what is left behind. But some techniques have become so interlinked with the idea of NLP that they cannot be ignored. Contains 25 of the classic NLP techniques. That is a 20% saving! Yes! I would like to order the NLP Skills Bundle for the Very Special Price of £24.97, saving 20%.